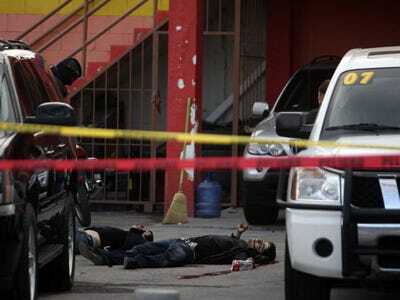 Mexico’s savage drug wars claimed the lives of three teenage boys in Ciudad Juarez this weekend. Two of the boys are believed to be American citizens from El Paso, Texas, which lies just across the border from Juarez. All told, there were 41 victims of drug-related killings in Mexico last weekend.The motive behind the boys’ murders is unknown. Local reports said the gunmen approached the the teens at a car dealership Saturday, demanding to see the owner, and opened fire when they did not get whatever it was that they wanted. The murders are further evidence that Mexico’s violent drug war is creeping ever closer to the U.S. border. . Gunmen shot and killed the police chief of Nuevo Laredo, a town along the Texas border. He had been on the job for five weeks. Five mutilated bodies were found near Monterrey, near McAllen, Texas. Gunmen also killed two policemen Monterrey over the weekend and local residents found three human heads on the side of the road just outside of the city. An Ensenada city councilman was killed in Ensenada, a beach town near Tijuana. Drug hitmen three grenades into a hospital in Matamoros. The city, just across the Texas border from Brownsville, is caught in the middle of a turf war between the Gulf cartel and Los Zetas. Meanwhile, in Austin, the capital of Texas, U.S. state and federal law enforcement agents arrested 13 high-level members of the Texas Syndicate, a state prison gang involved in drug trafficking. Officials say their investigation proved a long-held suspicion that Syndicate members are working for the Gulf Cartel, the Austin American-Statesman reports.